It’s true, when it comes to recreational sports for kids, there isn’t a need to replenish and refuel, like a collegiate or professional athlete. However, parent provided snacks are ingrained in the culture, and part of the fun and fellowship. As a sports dietitian and mom to an active 5-year-old, I approach “sports snacks” as an opportunity to provide the entire team, or kids in the neighborhood, with a nutritious treat. It may come as a surprise that when it’s my week to provide the team’s snack my go-to is homemade oatmeal cookies served with an ice-cold chocolate milk. 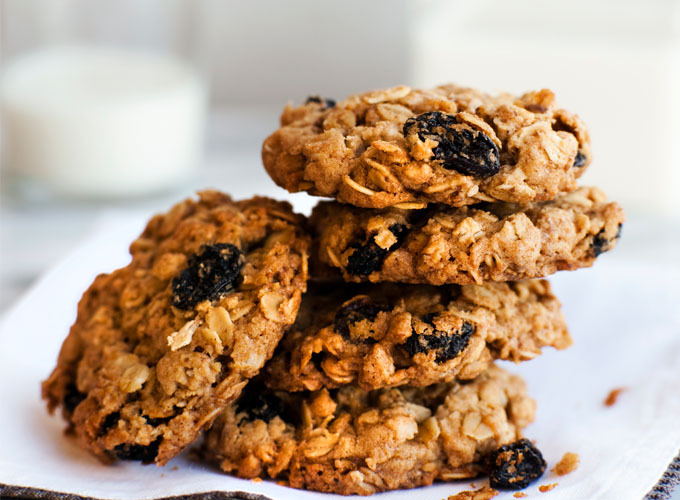 Did you know that oatmeal cookies have been around since the 1800s? By the 1900s, families enjoyed the cookies made from oats so much, Quaker Oats placed the timeless recipe on its containers. Which means kids and adults have spent centuries enjoying oatmeal cookies. Why take them away now? When you bake at home you can control the ingredients including the amount of added sugar and type of oats, helping to boost the nutritional content. Add in dried fruit, like raisins, or nuts and seeds to bake up a signature cookie. At its core, cookies made from old fashioned oats offer energizing carbohydrates, iron, and fiber to active kids. Wholesome chocolate milk is a healthy alternative to soft drinks and fruit juice because it’s packed with nine essential nutrients including bone building calcium, vitamin D, and muscle promoting protein. Oatmeal cookies also pair well with Greek style yogurt for twice as much protein as regular yogurt and the same nine essential nutrients found in dairy milk. Pro Tip: Encourage kids to crumble their cookies into the yogurt for a fun twist. Whether it’s served with a straw or a spoon, dairy delivers a powerhouse of nutrients to young athletes after a competitive match or productive practice. Up your snack game by offering treats that kids find delicious and moms find nutritious. This year, when the spring sign-up sheet comes around, don’t be afraid to take to the lead and score extra points with oatmeal cookies and nutritious milk or yogurt. Rebecca Turner is a registered dietitian, certified specialist in sports dietetics and author of “Mind Over Fork.” Follow her on Facebook and Instagram @theRebeccaTurner.